There are a few classic things that I feel like every cook needs to try at some point, even if you just cook at home for fun. Wontons are one of those things. I personally think they are kind of a hassle, but they are a good thing to know how to make and will expand your culinary skills. This week’s throwback recipe is from the first time I ever made wontons, for a wonton soup. This soup is light and healthy. It is great if you are feeling a bit under the weather or if you simply want a refreshing lunch on a cold day. 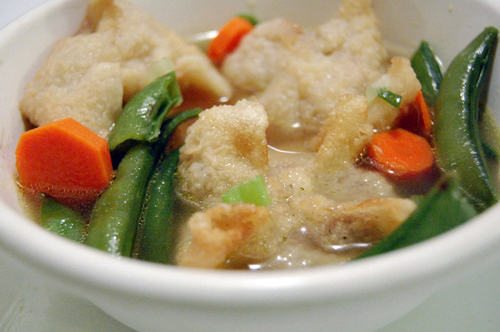 The fried wontons give the soup a nice crunch if fried properly. I usually struggle with frying things since I don’t have a thermometer and don’t fry things that often. It’s important to fry the wontons at the right temperature or else they will burn (too hot) or get soggy (too cool). Enjoy! It was recently one of my best friend, Kevin’s, 21st birthday. We have been friends since the 6th grade, so I felt the need to bake him very special birthday treats! I don’t really like to mess with all sorts of baking flour, so I just bought packaged cupcake mix. I think that you can still get creative by making your own frosting and adding your own twist to cupcakes- such as filling them with little tasty surprises like cookie dough and raspberries! These cupcakes were devil’s food cupcakes with a homemade buttercream frosting that is to die for. For an extra treat, I cut out a small circle of each and filled half of the cupcakes with cookie dough and the other half with raspberries and strawberry syrup. These cupcakes are easy to make for those of you who don’t feel that you are a baking expert, but still are a bit above your average cupcake. I will start this post by saying that I am aware of my pesto addiction. I find myself putting pesto on everything. The original recipe I found for these turnovers did not include pesto or cheese, but I felt that they would keep them from being too bland. My mom recently posted a recipe for Homemade Italian Sausage that had me intrigued. I was surprised how easy it was to make! I think if you are planning on dicing up your sausage, you might as well just make your own. These turnovers are a perfect lunch or easy-to-eat dinner. 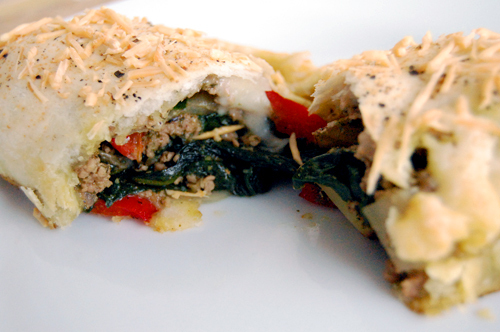 They have lots of healthy veggies and delicious flavor all packed into one little turnover (or one large if you are me!). You want to be sure to strain out the excess liquid after cooking the filling, otherwise you will end up with a soggy turnover. Also, you will notice that my recipe is in a new format. I finally got my new plugin, Easy Recipe, to work (HUGE thanks to my IT friend Cooper here in Cape Town!). If you are a food blogger you should definitely get this plugin, it helps your recipes get noticed on big search engines like Google by formatting them properly for the recipe search. This week’s throwback recipe is very memorable for me. I cook frequently for friends, especially my roommate. She is not a big seafood fan, but I have made her eat a few things this winter. This was one of the few salmon recipes that she liked, so I felt pretty accomplished! I think it also helped that I paired it with her favorite thing that I make- oven roasted potatoes. They are so easy, but so delicious! So this week you get two throwback recipes. 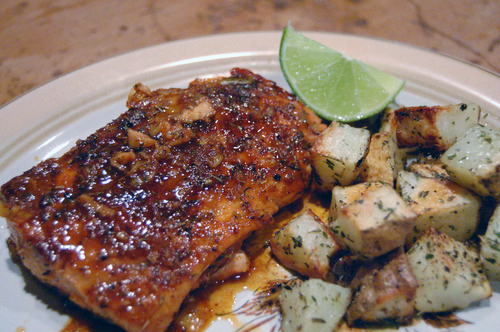 The first, a spicy salmon filet with a sweet orange glaze. The brown sugar and orange marmalade offset the spicy for a sensational taste. The second, seasoned oven roasted potatoes. These are easy to make and serve as a great side dish for tons of different meals. Definitely one to keep in mind. Today I would like to share with you a great slow cooker recipe, courtesy of Karen over at 365 Days of Slow Cooking. Being a snowboarder, I love slow cooker recipes. I can just put everything in the pot, then head out for the hill for the day. Karen’s site has tons of delicious slow cooker recipes for those who could always use a bit more time. She also has her own cookbook as well! With that said, I would like to welcome Karen! I don’t know if I ever mentioned that my most recent job was at Natural Grocers by Vitamin Cottage (don’t ask me why they decided to make their name so much longer and more annoying to say). After working at restaurants for so long, this job was so slow some days that I would read the cooking magazines at the register and write down recipe ideas; my boss probably wouldn’t have been too stoked, but what can you do!? I am getting off topic though, being a cashier is pretty cool as a foodie for one reason- seeing what everybody is buying and spending all day thinking what you want to make for dinner that night. The other day at work, a lady bought taquitos and reminded me how much I loved them, and how long it had been since I had had them! 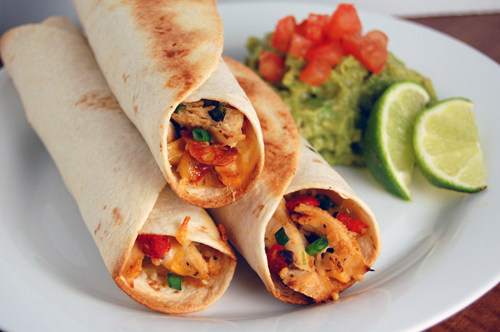 I went home that night on a mission to make my own, healthier, taquitos. I added roasted red peppers and green onions to give them some extra flavor. I also baked them, instead of frying them, which makes these tasty things much healthier. I would highly recommend making your own taquitos so that you can add your own twist like I did, it is much more rewarding! I also need to warn you that this recipe makes pretty big taquitos, three were plenty for me and I usually eat like ten! I am a huge fan of French onion soup. I love making it homemade because it is so easy, plus I think mine tastes better than most bought ones. This week’s throwback recipe is one of my random creations, there might already be a recipe for this but I thought I was pretty dang smart for creating this. One day, after a long day of snowboarding, I was craving French onion soup but I was starving and wanted more substance to it. 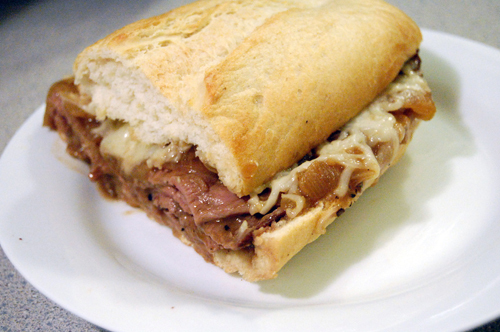 I came up with this French-Philly hybrid sandwich. It was absolutely delicious, but super messy! You will definitely want napkins handy while eating this bad boy. On a side note, I am leaving for South Africa today!! I am going to still try to post recipes that I made before I left, but they might not be as frequent. I am also going to have a few foodie friends post guest posts to help satisfy your cravings while I am gone. Also, keep an eye out for posts about my food adventures in Cape Town; I heard you can eat alligator there!